Believe it or not, we’re less than 12 months away from team USA’s next major tournament – 2011’s CONCACAF Gold Cup. Here’s a post-World Cup rundown of the US squad. While many of the players will be the same for next year’s Gold Cup, it remains to be seen whether or not that squad will be managed by Bob Bradley. His contract runs out at the end of the calendar year, and if Bradley wants to manage a European club (he was on Fulham’s shortlist but it appears the London-based club has picked someone else as their next coach), he’ll have to make a decision very soon, as most European squads have started their preseason friendlies. In August, two potential stars of next year’s tournament, Charlie Davies and Jermaine Jones, could see the field for their first action in almost a year. Davies has already participated in some FC Sochaux preseason friendlies, and Jones (a standout defensive midfielder who holds German and American citizenship) should be recovered from a leg injury that held him out of the entire 2009-2010 season. 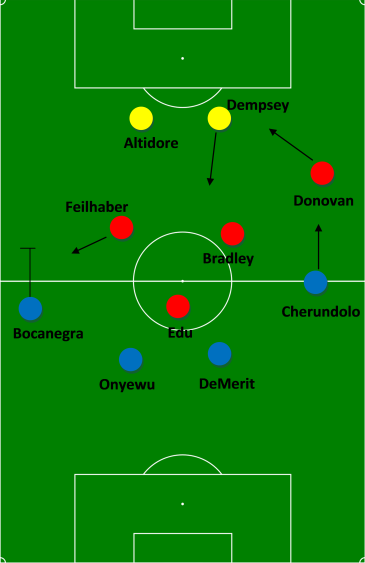 In each World Cup match, the gringos started in a 4-4-2, but in the second halves of the Algeria and Ghana games, Bradley the Elder tweaked the formation. FFG is adjusting his idea just a bit more. Against Algeria and Ghana, Clint Dempsey’s role as a withdrawn forward helped the US deal with three-man midfields. His success means Charlie Davies replacements Herculez Gomez, Edson Buddle, and Robbie Findley don’t see the pitch. Dempsey’s shift brings on Benny Feilhaber, who resumes his role as a false-eleven, pinching in to give extra support to Michael Bradley. Solid performances by Maurice Edu give the gringos a steady option to replace the disgraced Ricardo Clark. Due to the space along the flank created by Feilhaber’s positioning, Captain America Carlos Bocanegra is favored over Jonathan Bornstein. With Bocanegra on the left, Oguchi Onyewu resumes his center back position. This formation lacks width along the left wing, but with the emergence of the 4-2-3-1 at the World Cup, this modified 4-4-2 allows the US a better chance of maintaining possession. However, as was observed in England and Germany’s knockout round match, when a squad pinches in an outside midfielder, their opponents can run roughshod over the open wing. To that end, Feilhaber will swing wide when opponents have the ball, but the positioning of Bocanegra is crucial. Bocanegra’s limitations going forward serve as a boon in this formation, forcing him to play deeper than most fullbacks. Let’s be realistic, Charlie Davies will never be the same player he was before his accident, leaving the US with one striker capable of playing in Europe. The resulting formation will be abused by any team intelligent enough to observe the open left flank. The lack of quality options behind starting forward Jozy Altidore caused Bob Bradley to find a formation that works. His tinkering allowed the US to adjust to the World Cup’s tactical trends, and going forward, the gringos will be better equipped to control a game’s ebb and flow, not just react to it. I think Bradley’s done very well, but I don’t know about Fulham. He can handle the tactical stuff. I’m not so sure about the logistics of a league + cups. Yeah, he’d also be heading into a difficult situation. Last season Fulham had their best ever European campaign (they finished runners-up in the Europa League), and though they won’t compete in Europe this year, they’ll be expected to do well in the FA Cup and the Premier League.